Welcome to Day #3 of Appetizer Week, a multi-blogger event co-hosted by Kim of Cravings of a Lunatic and Kristen from Frugal Antics of a Harried Homemaker. Whether you are a Broncos fan or a Seahawks fan, we wanted to make sure you had plenty of ideas for your game day spread. Each day we will be dishing up a different set of appetizers. We hope you enjoy this fabulous group of recipes. Tune in each day starting with Monday, January 20 and ending on Saturday, January 25. 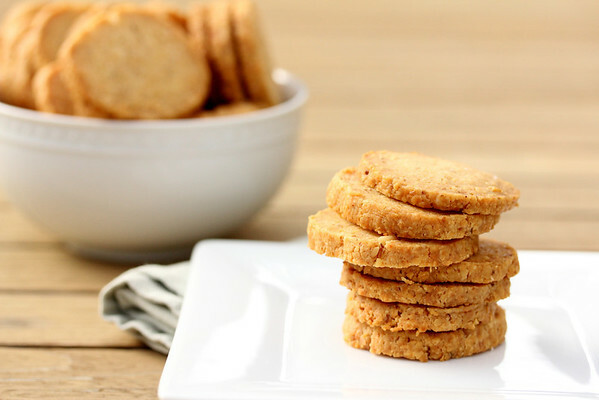 These cheddar cayenne coins with ground walnuts are really a savory version of a butter cookie. They are crumbly and cheesy, and the cayenne adds just a hint of spiciness. The part that hooks me is the cheddar. So good. It's cheese and a cracker baked together. 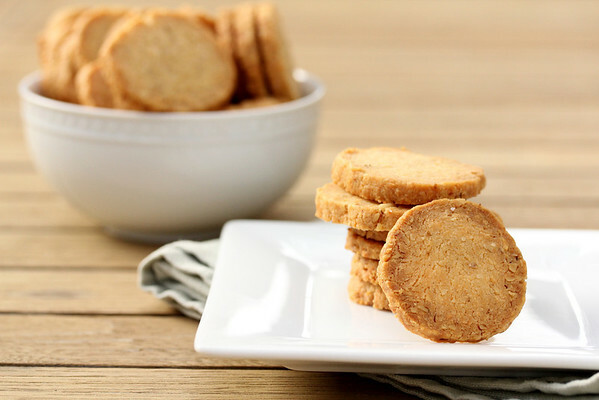 These savory crackers would be perfect with champagne or an aperitif. So elegant, right? 4 ounces cold unsalted butter, cut into 1/2 inch cubes. In a food processor, combine the flour, cheddar, salt and cayenne and pulse a few times, until just mixed. Scatter the cold butter pieces over the flour/cheese mixture and pulse until you get a crumbly mixture. Mix the yolk and water together and then drizzle it into the food processor. Pulse until you get even-sized small moist crumbs. Add the nuts and pulse a few times. Dump the mixture out onto the counter and push it together with your hands. Use a bench knife or scraper to flatten and fold the dough over itself. As it comes together, roll it into a 14 inch log and wrap in plastic wrap. Refrigerate overnight. Preheat the oven to 375 degree and line two baking sheets with parchment. Slice the log into 1/4 inch disks and place them 1/2 inch apart on the parchment. Bake, one sheet at a time, for plus or minus 18 minutes. Cool on the pan and then store in an airtight container. Both the dough and the baked cookies can be frozen. Perfect for impromptu parties! These crackers look terrific, Karen!!! I could eat that big stack and still have room for more! That's why I had to take them to work! I like the idea of easy and able to prep ahead of time. Me too. I get overwhelmed when people are in my house. Just the thing for the huge block of cheddar that *somehow* found its way into the house! :-) Cheese crackers are the best. I love cheese, fruit and cracker plates.... Soft cheeses and hard ones.